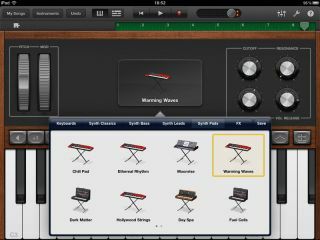 Apple has added support for the iPhone and iPod touch to the GarageBand app, which arrived on the iPad earlier this year. The massively successful home music creation tool costs just £2.99, but if you've already downloaded it for the iPad it's free to bring the app over to your other iOS devices. The app's universal nature means all of the features that made the iPad iteration one of the most popular of 2011. With virtual guitars, basses, pianos, keyboards and drum kits and more, it's easy to record your own multi-track tunes and you can also plug your instrument into the device's headphone jack. If you've never played an instrument before, Apple has you covered thanks to the "smart instruments", which will allow you to play chords and create beats with the minimum of fuss. Once you've created your musical masterpiece, it's easy to share it online or send it to iTunes. Apple's Senior VP of Worldwide Product Marketing said: "GarageBand on iPad has been a big hit and we think customers will love using it on their iPhone or iPod touch.